2013 Lexus IS unveiled | What Car? The 2013 Lexus IS has been unveiled at the Detroit motor show. 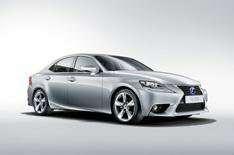 The all-new Lexus IS will be a rival for compact executive saloons such as the Audi A4 and BMW 3 Series. Lexus says it has been strongly influenced by the Lexus LF-CC concept car, which made its debut at the 2012 Paris motor show. Although the LF-CC is a coupe, the new IS shares many of its design features, including a large 'spindle' front grille and rear lights that swoop downward into the sides of the car. F Sport models have a sportier look, with a different front grille and bumper, and bespoke interior trim and front seats. Inside, the IS's cabin has a similar look to that of the larger Lexus GS, with a large display screen and simple dashboard layout. A lower driving position is designed to give a sportier feel, and the range of steering wheel reach adjustment has been increased over the current car's. Practicality is improved compared with the current car, Lexus says, thanks to a wider body and longer wheelbase. Thinner front seat backs help to improve rear legroom, while the rear seats have a 60/40 split-folding function. Paul Van der Burgh, director of Lexus Europe, told What Car? at the 2012 Paris motor show that the IS range will expand. As well as a new four-door saloon, there'll be a two-door coupe, which will look similar to the LF-CC. Van der Burgh also told us the current car's 2.2-litre diesel engine will be dropped from the IS range when the new version goes on sale this summer. Instead, the new IS will be available with an entry-level small-capacity petrol engine, while the big-selling model will use a fresh hybrid powertrain that combines a new direct-injection, four-cylinder, 2.5-litre petrol engine with an electric motor. The hybrid IS 300 model will be a direct rival for 2.0-litre diesel versions of cars such as the Audi A4, BMW 3 Series and Mercedes C-Class, with similar power and performance. Lexus says that CO2 emissions should fall below 100g/km, while average economy should be more than 65mpg. Our Green Car of the Year the BMW 320d Efficient Dynamics emits 109g/km. The suspension and steering have been revised to improve how the IS drives, and there's a new Drive Mode Select system that allows the driver to choose between Eco, Normal, Sport and Sport S modes. Cars that have Adaptive Variable Suspension have a fifth mode Sport S+. The new hybrid powertrain will make its debut in the GS executive saloon in the first half of 2013. Prices for the new IS are yet to be confirmed, but expect a starting point of around 26,000.